I wonder if the Swan of Busseto would have ever imagined the fortune of his Opera works in the current recording industry. I think the answer would have been maybe negative. But “il buon Peppino”, as his life companion Giuseppina Strepponi loved to call him, nowadays actually is one of the more enshrined composers of the recording industry. With this elegant slipcase we can travel for the second time along the most famous arias written by the composer. This is a walk along the first rough period till the age of maturity. 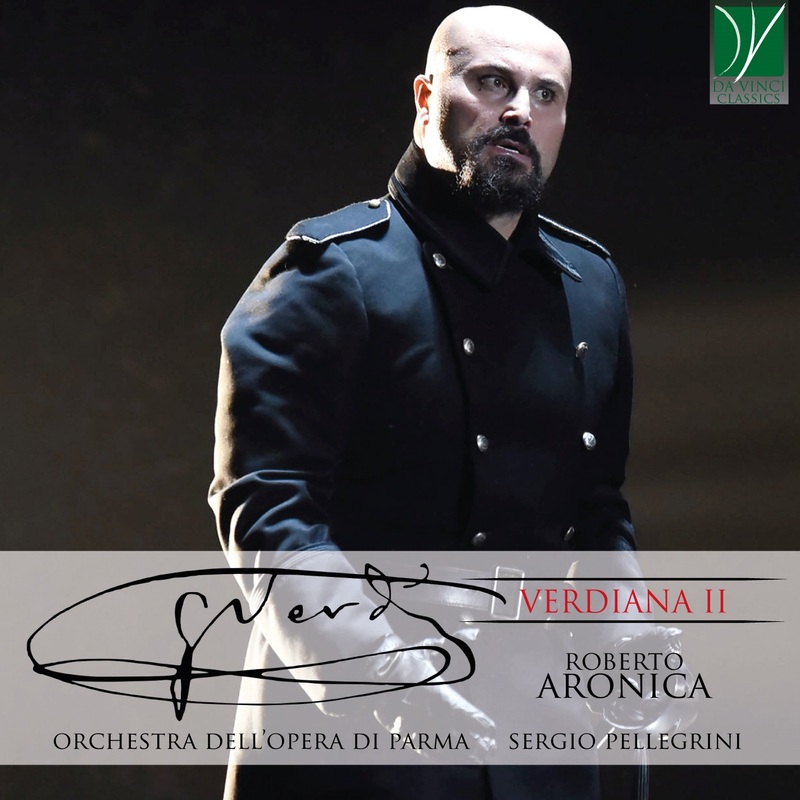 VERDIANA, conceived by Sergio Pellegrini at the head of the really valuable orchestras of Parma, here joins with one of the most important Italian tenor, Roberto Aronica. This second recording encounter, furiously rides the captivating strength of some really complex tenor arias, seemingly overwhelmed by “simplicity”. From the first “sacred” Verdi – Ernani and I Lombardi alla prima crociata- till the consecration of the so called “Popular trilogy”- Traviata,Rigoletto,Trovatore, which, to be honest, have nothing of “popular”, so much was the maniacal precisions of the canvas the composer used to weave between text and music. His scientific approach was at the base of a so refined orchestration that seems to be as so sensationally explosive as so descriptive and emotionally deep. Its dramaturgical complexion is not second to Shakespeare either. The countless “traditions” stand out in this cd, and the artists perform them with the will to express the real core of Verdi’s Opera language. The great Arturo Toscanini usually said that “tradition is a betrayal”; in VERDIANA II the different Opera traditions incline toward a higher dramaturgical sense joint to the music creative strength- a single fusion of theatrical and musical emotion. At the same time this cd also deals with the past performances by those singers who were sieved to the “inquiring eye” of the composer. Strepponi, Stolz, Tamagno- only to mention a few- spur in Verdi that “mystery beyond the notes”, which every performer should reveal to the creator. And we want to move from here to analyze the works of this cd. Aronica and Pellegrini are able to give the audience a miscellany of instinct and reason, roughness and delicacy, passion and meditation- together with the ability to express with diligent care the real Verdean thought. .
La Traviata, three acts Opera, debuted in Venice in 1853, with a cold result among the public. Verdi composed it, the most performed opera in the world, actually on one go, in the silence of Villa Sant’Agata, first in his mind and then on the piano. The glacial and tense sounds of the initial Prelude  open the cd. Only few accents interfere with the continuous line of the violin, never a vibrato. An upsetting fixity, lovely veiled by the harmonies of the dark arches, up to “Amami Alfredo”. This very delicate and heart rending introduction is a sort of “freeze-frame” preluding the burst of the feast. The same convulsion explodes into the character of the falsely shine Alfredo when he expresses all his love for Violetta. In Lungi da me…De miei bollenti spiriti , in the second act, the tenor agitates his youth ardor on the base of the arches’ unceasing pizzicato that surround a writing for a real lyrical tenor. He expands his vocalism towards a typical flat writing up to change in the growing finale of the caballetta. Now, only a cold and marble inscription reminds us Teatro Apollo of Rome, that doesn’t exist anymore. Here Il Trovatore was performed in 1853. Dark and lunar work, maybe it was inspired by the mother of the composer. Verdi was really close to her with a sense of absolute deference, even if in his long letters he never mentions her, with a sense of total discretion. He suffered really much for her death, and maybe the controversial figure of the gypsy (Azucena) has been inspired by her. Ah si ben mio…Di quella pira  is the most emotional aria of the entire Opera repertoire. The tenor first irradiates warmth to his passionate love for Leonora but then, through a sudden interruption of the musical writing, paralyzes a fighting impetus, a real redeeming scream for his mother. With this opera, Verdi emotionally farewells his mother. He felt regret for this tiny figure, almost never mentioned and obfuscated by the predominant and invasive figure of the father. Even if it was written in the same years, Rigoletto maybe is the most perfect opera of Verdi’s production. It is almost a ”Mozartian” opera, because the dominant theatricality, the vocal arduous difficulties together with the orchestral and vocal balance – so that every parameter is “uncover” (almost like in Bellini)- convey us a mosaic, perfect in every single musical aspect. Stravinsky tersely pontificated against Wagner that there was more music in Donna e’mobile  then in all the tetralogy of the German composer. This strange but smart consideration makes us understand how Verdi’s mastery was able to touch only with “two notes” the infinite deepness of the human soul and how this little ballad could merge into the already mentioned stylistic and formal perfection of a Mozartian style. This stands out in Questa o quella , and explodes in the reflective and intense Ella mi fu rapita…Parmi veder le lagrime [9, where Verdi in the character of the Duke of Mantova actually creates some of the most pyrotechnic and brilliant arias in contrast with those other arias in which the voice widens with more weight, as he would anticipate in Rigoletto the so called three voices for the Violetta’s soprano in Traviata. So, nowadays the performance of the “popular” Verdi is a complex activity, even if this works could touch the souls and even if everyone had assumed in a personal way every melody, proud of this own personal knowledge. But Verdi himself said – to be sure that his works were performed so as he had conceived them- “I created Rigoletto without arias, without finales, with an infinite series of duets because I was certain of it. If someone adds something else, I will say…It’s right…But I wasn’t be able to do better”. And here we can see the farming pragmatism of a frank and simple man, exempt from temporary palinodes. He had to fight a lot against the censorship, changing many times the title of the work to do not disturb the sovereigns. We can see how he actually thought about a “popular” work, conceiving an overall and unitary vision of the drama – so as in Wagner. He so forestalled the times through the creation of a drama with a consecutive style, and not with a fragmentary one in favour of the banal purpose to obtain a temporary national-popular approval. I Lombardi, Ernani and Macbeth belong to his “Galley-slave years”. Between the 18th and the 22nd of March of 1848 Milan fights and, in five memorable days, wins his struggle against Field-Marshall Radetzky and his 14.000 men. The people of Milan build barricades and take to the streets, besieging the city. The Austrians are forced to cede Porta Nuova and Porta Tosa, and to abandon all their barracks. The night of the 21st of March Radetzky pulls his troops back. The years between 1842 and 1849, are really difficult for Verdi. The recent failures really touched him. He feels the necessity to keep up with his famous colleagues. Even if the deep dramaturgical sentiment – which will later become his own typical language – is now still immature, in these works there is the most cherished Verdi. He awakens the patriotic feelings of the passionate public that crowd the galleries of Scala and Fenice. Viva Verdi, with its anti-Austrian duality, appears on the wall of the city and fires the hearts up. In these works, the vein of an intense lyricism pulses together with vocal virtuosity. There are also typically “sacral” features, coming out from the peasant’s impetuosity of the band that he deeply loved in his early years, here joint to a stylistic severity that already appears as a fundamental characteristic of his style. In Macbeth, written in 1847, in Ah la paterna mano , it stands out the use of the single instruments (clarinet) to depict the figurations skillfully interlaced with Macduff’s vocal line. Quando le sere al placido  connects the previous age to the full maturity. This Aria is extracted from Luisa Miller, the three acts tragic melodrama, which Verdi wrote in the end of the 1849 for the San Carlo Theatre. Here Rodolfo praises his exacerbated love for Luisa through the pure nature of a heartbreaking melodic line. In Un Ballo in Maschera, written in 1859 for Teatro Apollo, Verdi was subjected to that monster, which the Neapolitan censorship was. It refused the murder of a Chief of State and most of all was contrary to a female betrayal. It is the same Verdi who bitterly talks about the fact: ‘I am so much in trouble. Almost surely the libretto will be not approved”. So, sure that his genius should never retract his ideas, he decided to break with Naples and provocatively moved his work to Rome. His rigor was actually so strong, impervious to the “good manners” of his time and allergic to criticisms and concessions. In Un Ballo in Maschera, a really refined work of clear writing and formal perfection, Verdi creates an elegant and polished polyphonic counterpoint between the orchestra pit and the stage- since the first quotations of the taunt in the short introduction to the whole of the work. In Forse la soglia attinse..Ma se m’è forza perderti,Riccardo is the typical Verdian tenor. Lyricism, strength, vocal sculpture, depicts a text, which is in its turn really pertinent to the rhythmic aspect. These actually are the features of the mature style. VERDIANA II catapults the listeners into the enriching path of that pure, bright and also instinctive art of the always modern Verdi: now more relevant than ever. Roberto Aronica was born in Civitavecchia, Rome in 1969. He studied with Carlo Bergonzi and completed his studies at the Accademia Chigiana in Siena. Roberto Aronica made his professional debut as the Duke in Rigoletto at Teatro Municipal in Santiago de Chile. He has performed at the most renowned opera houses in the world: Teatro alla Scala, Metropolitan Opera of New York , Paris Opéra Bastille, Royal Opera House of London, Lyric Opera of Chicago, Liceu in Barcelona, Maggio Musicale Fiorentino, Teatro dell’Opera of Rome, Wiener Staatsoper, Zurich Opernhaus, Berlin Deutsche Oper, Bayerische Staatsoper, San Francisco Opera, Los Angeles Opera, and the Japan Opera Foundation of Tokyo. Roles have included Manrico in Il trovatore at the Teatro Comunale Bologna and Don Carlos at the Royal Opera House Covent Garden London. He has performed in Madama Butterfly at the Liceu Barcelona, Un ballo in maschera in Peking, I masnadieri in Parma, and La forza del destino in Bilbao. In 2014, he made his debut in Turandot in Turin, followed by Norma in Cagliari, Carmen in Shenzen, Madama Butterfly in Verona, La forza del destino in Parma, Attila in Bilbao.